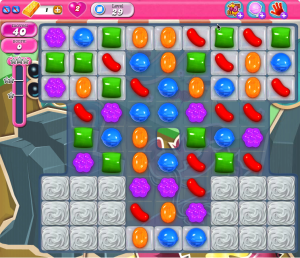 Candy Crush level 29 is a Jelly busting beast. There aren’t to many factors that play against you in level 29 of candy crush. There is lots of jelly, but thats all your really dealing with. On candy crush level 29 you are given 60 moves to score a minimum of 100,000 points. These are only the minimum requirements to complete the level. 60 moves seems like it would be enough to complete the level easily but it will sneak up on you quickly. If you just work from the bottom and use special combinations then you will pass the level 29 of Candy Crush Saga. Starting at the bottom of the board will help you clear out some jelly on the bottom while moving things around on the top of the board. This will save you moves and hopefully give you free combos and maybe even special candies. Also, try to work on the corners as they will be the hardest jellies to break and can come back to haunt you when you only have a few moves left to break them. A great way to get through candy crush level 29 is by combining special candies to knock out the jelly and meringues with one blow. If you don’t have experience combing striped candies give it a try. Each special candy has a different effect when combined with another candy. For instance, a striped candy/wrapped candy is super effective when trying to clear jelly. This combo take out 3 full rows and 3 full columns of candy and jelly. Also, using a chocolate sprinkled candy with a striped candy can result in a great jelly crushing effect as well. If you get the chance to move the special candies together, DO IT. This will help you get through level 29 of candy crush with no problems. If you are still having trouble beating Candy Crush Level 29, try watching the video walkthrough or just comment below and we can help you out! 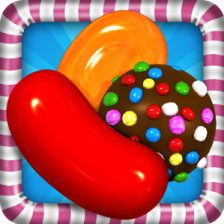 All intellectual property rights in and to Candy Crush Saga are owned by King.com Limited, including copyrighted images and trademarks from Candy Crush Saga. This website is a fan site and is not affiliated with King.com Limited in any way. I ell any one its fun becouse I do not think have tryed and tryed to beat level 29 have even cheated no way I can do this.any other idea’s you loose more lives than ever.I had no more jelly’s and 100.000 points and it still would not let me win I am upset with this game and would not tell anyone to play it. That’s not the goal. If you think you have to get that score to win you are wrong. Actually you have to clear the yelly. You didn’t clear it. This is a very hard level to beat.. Tip: Lollipop hammer works well to clear the last 1 or 2 jellies.